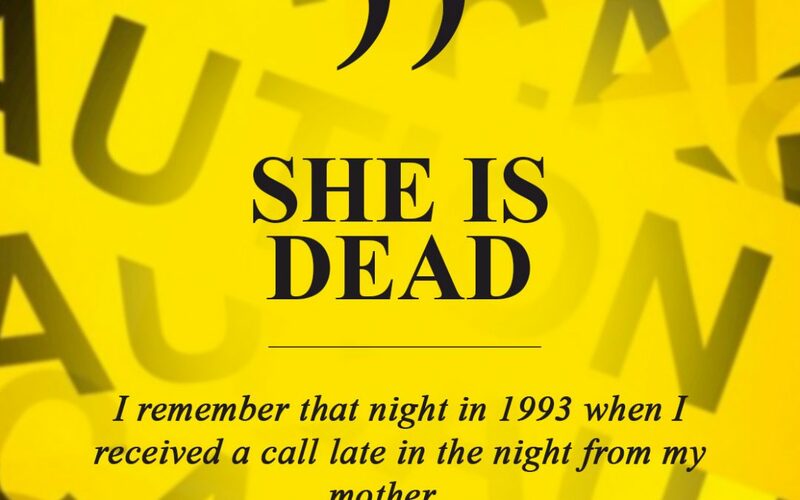 I remember that night in 1993 when I received a call late in the night from my mother. “He killed her!” “Who killed who?” “Dankie killed Diane but he also killed Trina,” she cried frantically. This had to be the worst call I have ever received. The cries over the phone from my mom were heart wrenching. The man who our entire family had befriended and embraced as a nice guy had just murdered my aunt and her 13yr old daughter while her 22month old daughter watched. He did not just stab once or shoot one time, but he butchered them. The Washington Post described it like this “The crime scene at the house in Northeast Washington was like nothing he had ever seen, the killer’s rage so evident. Hawkins’s heart was left adrift among her innards; her daughter’s was gone.” Who does that to anyone and to a family that have shown you so much love and compassion? How do you murder the mother and sister of your son? What caused you to become that angry and bitter? What happen to your soul for you to enter into such a dark hole? “WHAT HAPPENED” are the two words that my family will have until Jesus returns. If you don’t get out for you then get out for your kids so we can stop this. My husband says all of the time that more is caught then taught. Let’s send the right message. If this is you that I am speaking of get a plan of action in place to leave. Some say they don’t have the resources to leave. Well, I would rather sleep on a curb alive to raise my children than buried and the system is left to do it. Your life and the life of your children are just that serious. Statistics also show that 70% of the women in prison are there for domestic violence. Don’t allow anyone to push you to take a life and to give yours up. You are needed in the earth to fulfill purpose. Walk away with pride and dignity. Listen you are better than this. You have been created in the image of God and you are the King’s daughter. David had that revelation when Saul’s boys told him that he could marry the king’s daughter since he had killed Goliath. David told them they were speaking like marrying the King’s daughter was something light or small. He had a revelation that if he didn’t do right by the king’s daughter that could mean death for him. Baby girl you are the king’s daughter. This is for everyone that is reading this. You are wonderfully created to take care of the Father’s business. Don’t allow any man to take your self-esteem, self-worth, or your self-value away. Jesus paid His life for your worth and He is the only one that has the right to define you. So hold your head HIGH today knowing that you are royalty and that you are one bad chick. I personally have never been abused but I have family and friends that have been. They need our help, their ability to reason correctly has been compromised. Don’t give up on them!!! If this is you please get out, I know it may not be easy but living beats being dead everyday. We love you. Good read and encouraging. Thank you, Dr. Dee Dee, for shedding some “church light” on this subject! I lost a cousin to domestic violence and like your aunt’s case, he shot her multiple times in front of her two young children. The church can no longer be silent or timid about this subject. Thank you for giving her a voice in this blog! I e@s in an abusive relationship, some physical but most mostly emotional which can be just as detrimental. We were in church and when I decided to leave him, most people couldn’t understand why I would leave someone who appeared to “love me so much”. Little did they know he was one way at church and completely another at home. But I knew I deserved more…my daughter’s deserved more. It took courage but I did it. It’s been 8 years and I’m still recovering from the silent, invisible scars he caused but thank God I’m still standing! Oh wow…thanking God you and your courage to take a stand. May God continue to bless and heal you on this journey. I read this and memories of guns pulled on me, strangled, pillows over my face and a shoulder out of place being 8 months pregnant and I stayed for 13 years. The gun did it for me and now at this time I am seeing again how God kept me when I did not even realize He was doing it. I got out and I encourage others to do as you have stated, get a plan, get some help and Get OUT! Wow, what a horrific story! I’m so sorry that Diane and Trina experienced this, but also everyone connected to them. Our lives are valuable and you said something that I will continue to focus on, “You are wonderfully created to take care of the Father’s business.” I have a purpose and don’t want to get to heaven to discover all that God had for me because I didn’t discover it here on earth. It also seems that I have a responsibility to value my own life so that I can experience his best. Thank you for caring enough to share an experience that you didn’t have to share. I was in an abusive relationship for several years and almost lost my life in front of my kids. I thank God each and everyday for getting me out of that situation. I wish I had something like this to read and someone to talk to. It definitely would have helped to open my eyes. Wow! I had not experience any physical abuse for the short time of my marriage, however, I would constitute his silence and willingness to be an inactive part of the relationship as emotional abuse, leaving me feeling somekind of way. I am thankful to God that my spirit and my strong-will didn’t take me down a road that could have not ended well either physically or emotionally. My heart weeps when I hear stories like this. Thank you for sharing this!! We must STOP being quiet and think everything will be ok when it isn’t. This is a very good article and this type of scenario is happening more frequently and more severe. Just last week the woman of four children whose husband killed them and cut the wife’s face, she had to bury her children and then go to court and see him be charged with murder. Keep helping Dr Dee Dee and plan to donate to your cause. The sad part about “abuse” is recognizing it as abuse. Denial will cloud what’s truly happening. While in an abusive marriage, I had no idea that what was happening to me was “abuse”. We didn’t agree on things…we had misunderstandings…those grew to we had a fight…and another fight…then another fight. But it never clicked that I was in an abusive relationship until after I got out and heard other women speak about their situations. I didn’t grow up seeing that pattern and I didn’t see it happen to other people, so I couldn’t properly identify it. But I knew that it wasn’t right and I didn’t like hiding it from my family and friends. Two important things are recognizing abuse and getting out alive. If you have to hide or lie about an incident, then it’s not okay. Living in fear is not okay. Thank you for this post. My mother was a DV survivor. She got away from my father and had to raise me and my sister on her own and guess what she did it! She was a woman of God and relied on our Father for everything and although there were some tough times we were always safe and had everything we needed (even if it was just what we needed at the time). Eventually my mom was able to buy her own house. I’ll never forget the words she shared with another woman who was in a violent marriage “you can get out; you can do it” and then she opened her doors to both the woman and her three children. The same God who got my mom out is the same God we serve today and He is no respecter of persons. Thank you for this post!! I feel the pain as I read! Thanks so much pastor Dee Dee this is so on point and true. I am currently separated because I finally decided to get out of an abusive marriage. Initially I felt because I said I do that I should stay and make it work(especially because it was marriage number three),that it would get better, that he would change and stop the abuse,because of my love for him. He literally wanted me to cut ties with family,friends, everything to make it work. But I finally realized that no matter what, there was nothing I could do to stop the abuse and that even though he said I will not hit you again, eventually it would happen again and the next time might just be the final time for me. The funny thing(not ha ha funny)..I worked in a field/profession where it was my job to protect and serve others yet, I myself would not fight back when it came to love. I am in a healing process inwardly now, realizing that I deserve better and I don’t have to settle, even if the person was raised and brought up in church and with Christian values. What an excellent post! Thank you for bringing attention to this subject, so others can be free and get help! I pray that anyone who reads this blog will be receive the help and protection they need from their abusive relationship and will be connected to someone who can help them, in Jesus Name!! This was very heavy topic this morning and so real.Im sorry to hear about your family members. Abuse have to STOP.There is no shame in crying out for help.Take every step to remove yourself from this situation.Im glad that you Dr.DeeDee are using your platform to HELP All victims of abuse. I never been abused physically but I have emotionally. I thank God for allowing to love myself more than anyone. I now know that I am precious and I deserve better. Your doing an amazing job Dee Dee, people need to know that it happens in the church as well. People need to know there is beauty for their ashes. Thank you Dr Dee Dee for speaking about domestic violence. If you are living in a violent domestic environment please get out. It will save your life and the life of your children. Amazing! Reading this brought tears to my eyes.This is my story. It was my mother that was killed and I was stabbed twice,my bothers friend was stabbed,he went for my brother but my mother jumped in front of him.All the while my two year old brother was watching . I was pregnant at the time.Thank God my child survived. Children suffer a lifetime,because most people forget about the children. Thank you for letting me share part of my story. Wow! This brought to mind Bobby Christina and Jennifer Hudson’s family and many other well known abused victims of assault or murder. Getting out can be very difficult for some women. Learning to love yourself and getting to know your self worth/ value is right on target Dr. DeeDee. That is why the work of Christ is so important. Discipleship programs, mentor programs, young adult , youth ministry, and training programs are needed to address some real life issues in the church and schools. We have to lift up a standard against the enemy and break the cycle through prayer and education. Jesus is the “rock”. We have to build our young generation’s faith on the “rock” thru the teaching of Gods word, and the gates of hell shall not prevail against them (Matt 16: 18-19). Thank you Dr. DeeDee for sharing your story. I’m so sorry your family had to endure that terrible tragedy!!! I witnessed abuse in my home and accepted many forms of it throughout my lifetime. It is a horrible way to live and I pray your message reaches those that need the courage to get out and get help. Does the church have a ministry specific to serving the community and victims of Domestic Violence? I know the purse drive just ended. I would like to be a part of the service team if one is established. Thx. Dr.Dee Dee this is a real issue that affects people everyday and you truly tugged at my heart strings. I pray that someone who is dealing with this has the courage to get out. What I really wanted to point out is that after reading up on this tragedy what really stuck out was how your family supported the prosecutor. Even in the midst of your family’s horrible tragedy you still offered support and encouragement to him in his time of need. You showed that even in our darkest time you still have to show the love of Christ. So while that is an experience that your family may never forget the prosecutor will never forget how you blessed him too. Your heart is so pure towards God’s people and I truly appreciate the love that you show. Thank you for sharing. Wow,thanknyounfor sharing this story. You Don’t really understand your situation till you heard someone else’s story, I am not in a violent relationship but feeling like you self worth is being drained away and the person you know you are is fading!….this is a wake up call. Grateful for by our blogs and messages of hope. Be blessed in all you do. I am royal and I have a awesome father in heaven who wants only good for me. Wow.powerful…. This is so on point. It is time to take a stand against Domestic Violence, we cannot let this continue to go unchecked. I was in an abusive relationship because I thought he loved me, and it was me doing something wrong. But one day I woke up and looked at my 4 sons and asked myself would I want my sons doing this to their girlfriend, or wife. No I wouldn’t, and at that point I left and never returned. I had to learn that my husband now isn’t the guy that abused me, I had to pray to God to help me learn to like him and learn to love him. I also had to pray that my sons would learn to trust this man with me, as well with themselves. Thank God he walked me through it and I am in a better place with a loving husband and loving sons. Thank You Dr. Dee Dee for this article, it’s a real help to someone who needs it! Praise God for you and for teaching women who they are in Christ Jesus. Teaching them that it is not OK to stay in an abusive relationship. I remember when I walked on egg shells because I didn’t know from one minute to the next when he was going to explode. I was in an abusive marriage for three years. I had no one telling me I was the King’s daughter, I was so much better than my relationship, and/or I had a purpose to live out in the earth. I was in the Army during those years and I saw my husband as an enemy who had to be destroyed. Therefore, I was going to kill that man (the one standing over my 9 year old, sweet, disabled daughter, yelling at her as she cried so hard) and all I needed was a weapon/gun to accomplish that death mission. Yet, for the grace of God a Prince George’s County Domestic Violence Center was used as a means to save my life and the lives of my children and grandson. I was accepted into a program that required me to attend weekly group sessions. One of the women in the group made me a copy of a magazine story about a woman who went to prison for killing her husband. She helped me to see me/my situation more clearly, how I would be charged with murder and would be put in prison, losing my children/grandson, career, home and everything else dear to me. Those weekly group sessions showed me how to file legal papers to protect myself/children/grandson, what to expect within my home when violence was about to strike, and most importantly how to escape safely. I remember a picture at the center that had a casket with a beautiful flower arrangement in the center of the casket, the caption stated: “He hit her 1,101 times but he only give her flowers once.” That image stays with me even though that was over 24 years ago, and I still know/understand the red flags/signs of power and control within a violent relationship. Dr. Dee Dee, please continue to be a voice for the women, children and men that are in domestic violent situations. Having gone through that was one of the worst experiences in my life. I believe the church has taken a back set on that issue and I believe the church should be a voice for the powerless, and the hope for the hopeless. You are doing an awesome job and I thank God for you!!! Powerful words but my God my heart can’t take it. This titled had me all shook up. I guess it’s just the times we are living in. Too much going on. I stand behind you 100 when It comes to the queens or kings in that matter. No one should have to experience such a thing. Thank you, Dr. Dee Dee, for sharing on this subject. As you know what I have been through, I totally agree. This post Dr. Dee dee speaks loud, never experienced it but my husband had as a child experienced this and I was the first person he ever shared it with, and as he poured out I begin to pray. Thank you for sharing this I hadn’t realize how it has grown. God is able to restore the curse has been broken here. I pray that more communication will take place, judgement will stop, ears will be opened to hear as we pray for domestic violence to stop and encourage one another that we are daughters and sons of a Mighty King. Besides prayer Dr. Dee Dee how can Forty Four Angels and The D.E.N.I. M Project (Discovering, Empowering,Nurturing, Inner, Me ) help and work with you? I have never been in an abusive relationship. Thank God. I do pray for those that have and have gotten out, and the ones that in one that God would lead them and kids out safely. I love what you are doing. There are a lot of women who feel there is no way out. Thank you for providing a safe haven for the ladies that are coming to Dee’s house. It took me 15 years to understand the instruction and advice from PastorMike and Dr.DeeDee. I have been out for seven years now. Don’t be like me and allow someone to continue to emotionaly manipulate you into not leaving an abusive relationship any longer. Believe me I know, it’s hard but we are worth it. Thank you for talking about this it’s very much needed. This story had me feeling some kind of way. My insides are actually trembling and my eyes are teary. This was definitely a horrific crime. I always wonder how someone can say they love an individual and do something like this. I know of church members being abused but because the pastor look at them as a happy couple they will stay in that bad relationship. Yes very true as I was a victim of domestic violence. I ran several times but he found me; one night I prayed and asked GOD to remove him from my wife or I was going to be in jail. He did it that was in 1993. Today my ex-husband and I are friends you see he went to prison for 23 years and recently was released but he is a changed man. We has apologized and asked forgiveness as he says GOD has changed him. I am Christian so I forgive but not sure where I would be had I tried to stay. I got out and with Jesus on my side I hold my head HIGH, Thanks Dr Deedee! Thank you for shining some light and what you’ve shared on this topic. My dad was extremely abusive to my mom. One day, she gathered my brother and me and left, leaving all of our stuff behind. Subsequently, my parents divorced. We stayed with a family member until we were able to move out on our own. My mom didn’t want any connections to my dad, so she never pursued child support or anything, though she did have to file for bankruptcy. She didn’t intend for us ever to see my dad again, and we haven’t. It’s been over 35+ years. I would have wanted to have my dad in my life but certainly not under those circumstances. God, my Heavenly Father, has made all the difference in my life and I am so grateful for Him and that He’s able to provide where there is lack in our lives. I know that my mom probably would not be alive today had she not left. Sadly, I had a cousin that suffered for years because her mother told her that God hates divorce and she was out of the will of God if she left her husband. She tried leaving a few times, but again, mommy said just keep praying for him. It wasn’t until he called her mother and said I’m sending your daughter home to you in a pine box that changed everything. She got the courage to ignore her mother’s voice, she packed up her car with clothes and her young daughter, (getting clothes was wasted time) got in her car to leave. However, her husband came home early ( we believe someone told him what was going ). He shot her dead through the car window as she was pulling out of the driveway. Ladies, if you need help, please please please hear me, GOD will approve of you leaving, that person is out of the well of God – NOT YOU! That was so powerful and if memory serves me right, I remember the incident itself, and the house it happened in. It was an eye opener for me. Dr. DeeDee that was a horrific turn of events, but the message you relayed will save someone’s life. Thank you for the love, wisdom, knowledge and the stories you share, they are truly life changing. Thank you, for shedding light on an issue that needs to be addressed and fixed in most community. It is so sad that one in four women are victims of Domestic Violence..Heartbreaking! For the month, October please put your purple lights in the windows of your homes to raise awareness for Domestic Violence. Thank you, for sharing light on this issues that need to addressed and fix in most community. I am a childhood survivor of domestic violence and sexual assault. I appreciate you so much and love you to life, woman of God!! This is the absolute truth! Share Dr. Dee’s blog with everyone! PLEASE, PLEASE, PLEASE listen to Dr. Dee Dee and TRUST GOD to help you escape. When you make up your mind that you will not take abuse any more, and seek our Heavenly Father’s help, HE will not fail you nor forsake you. HE promised that those who put their trust in HIM will not be ashamed, and HE is faithful!. In trusting God, you will find help in the most “unlikely places”. Your situation certainly did not catch God off guard. He is Jehovah Jireh, Lord God Provider. He has already looked ahead and made provisions for every one of our needs. Your answer has already been provided. However, God will no usurp your will. If you choose to stay in your abusive situation, HIS Hands are tied because of your choice. You have to realize that you are not alone. There is help if you are willing to seek and receive it. Please Trust HIM and listen to the Godly Wisdom from the heart of Dr. Dee Dee. Choose Life! This is a courageous statement, that must be said. I pray that every person who reads this will see that it is possible, there is hope, and there is help out of an abusive relationship. I pray that they will see the light and walk in it to freedom; that Jesus died for their freedom from this too! That demon of abuse comes out of addictions, mental illness, lack, etc. If necessary help your loved ones from a place of safety but this domestic abuse, my heart says “I am somebody” Dee’s House of Hope is one way to help; I look at the roots of a thing but there is a time when you have to help onsite, and be a present help and get the information for understanding to them later. Amen, I absolutely agree that Dr. Dee Dee’s House of Hope is a way out !!!!!!!! Thanks for the encouragement! I look forward to your blogs! Thank you Dr DeeDee, I have been watching you and Pastor Mike on the new Hillsong channel, and set my clock to watch the ministry. I just registered last week and I thank you for your blog. This is very real in the church and I’m grateful for not being physically abused however emotional abuse is painful. Unfortunately this is a “learned” behavior, and too many women think if they just do everything the way he likes or try not to make him mad that they can change him! Beautiful sister you can only change you, or the way you respond to a situation. In the words of the songwriter…(Jesus) you thought I was “worth” saving, you thought I was “worth” keeping, you thought I was to die for. The key word here is WORTH! Jesus paid the ultimate price for your life!! He sees you as “valuable” and precious like a rare gem. So please see yourself the way He does. You are loved. Make your plan of escape and ACT ON IT NOW! You DESERVE better. Dr. Dee-Dee, what a test for your family and what a mighty God that has caused your family to go on and heal daily. I counsel people weekly about abuse and I personally know quite a few of Pastors that live this life daily, pretending to be ok because they are afraid that their leaving will tarnish their influence, anointing and ordained appointment by God. I pray for strength and courage to be upon everyone and anyone that is experiencing ANY type of abuse, to be able to separate, leave or dismiss themselves from such unfortunate and unnecessary treatment. Thank you for Speaking, Sharing and Standing for Self Love, which will cause a person to realize “they don’t have to take this”.Your position and voice will help millions, your book will reach millions and your testimony will free millions in Jesus name. WoW! This really saddens me. I,too was in a very abusive relationship and I went through it alone, my family lived in another state and I was scared to tell anyone. I kept running from house to house trying to escape but eventually I had to come home. I was thrown down the stairs when I was 7 months pregnant I was scared I was going to loose my baby. Then once I thought I had escaped he showed up at my job and kidnapped me and we were on a high speed chase with the Police, he took me to an apartment building where the SWAT team was surrounding the building. While I was in the building I actually saw people on TV being interviewed on Fox5 about my kidnapping at my job. That’s when my life flashed in front of me. I did’nt think I was going to get out alive. By the grace of God I survived. Keep doing what your doing Dr. DeeDee by spreading the word. I remember this story. I also recall there was a prayer visual for the family members during this time. I am a survivor of domestic violence… I wanted my marriage so bad, I took the abuse. All I wanted to do was to make him happy. He wanted kids because he came from a large family. So I thought having kids would make him change. I suppose this was my way of trying to make him happy. But nothing changed. However, once I realized this man was sick and I needed to get out because things weren’t going to change. He was a ticking time bomb. He was/is the nicest person to others….but behind closed doors he’s a monster. To God be the glory, I got out 18 years ago. No one would ever knew … I was ashamed and hide from the truth for years..it’s taking me years to finally be able to talk about my experience. I have been blessed to be a blessing to others. I’m so glad the church is teaching on this subject because I grow up in a family that taught… once you get married you stay married..it’s until death do you part. I was almost killed because of that teaching. Wow, this is powerful and so important to share. Thank you Dr. DeeDee! GOD BLESS YOU FOR THIS MESSAGE. I used to work at the House of Ruth shelter for battered women. I saw first hand the devistation of domestic violence. I have also seen the church “turn the other cheek” when it comes to addressing this enormous problem. This behavior in the body of Christ needs to be exposed. Way to go Dr. Deedee! Thank you so much for sharing this message. We have been silent too long. Domestic violence leaves individuals and families vunerable to continue acts of violence. I want every victim to know there are resources for assistance. Also, I want them to know they are not alone. Thanks for touching on this subject. I am a domestic violence survivor (my ex-husband held a loaded gun to my head in front of my kids)and I with you urge women to make an action plan for leaving. Talk with those you hold dear so that they can assist you. I believed for so long that I had to stay because God did not honor divorce. Thank you to you and Apostle Mike for explaining the 3 A’s and Divorce. Some women have had their self-esteem and worth so broken that they believe that they can’t make it on their own. Keep building these ladies up so that they know who and who’s they are to decrease the statistics that we have now. Thank You-Thank You-Thank You!! That was so good! Thank You!